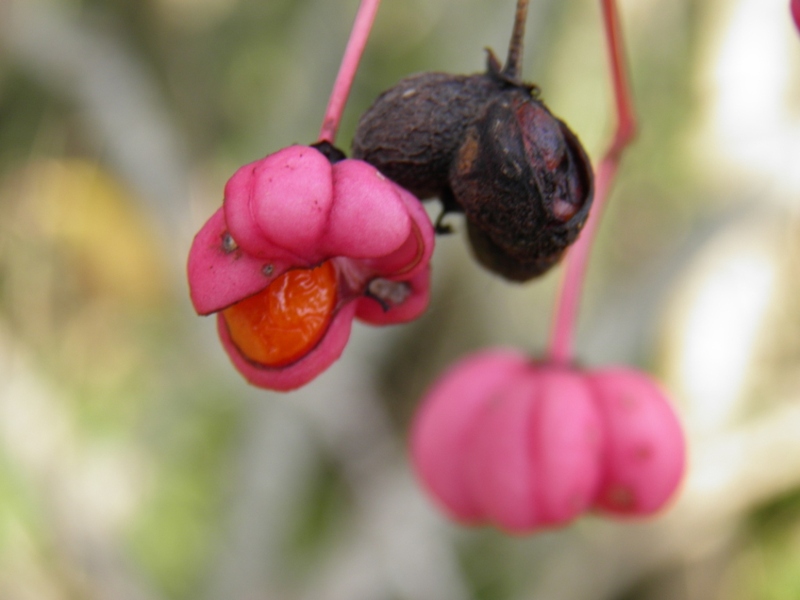 When I lived in Nottinghamshire and botanised with my friend Mary, one of the plants that gave her a lot of pleasure was the Spindle (Euonymus europaeus). She proudly showed me the last remnant specimens along a stretch of a local hedge. It is an easy to miss shrub amongst Hawthorn, Blackthorn and other hedgerow plants. 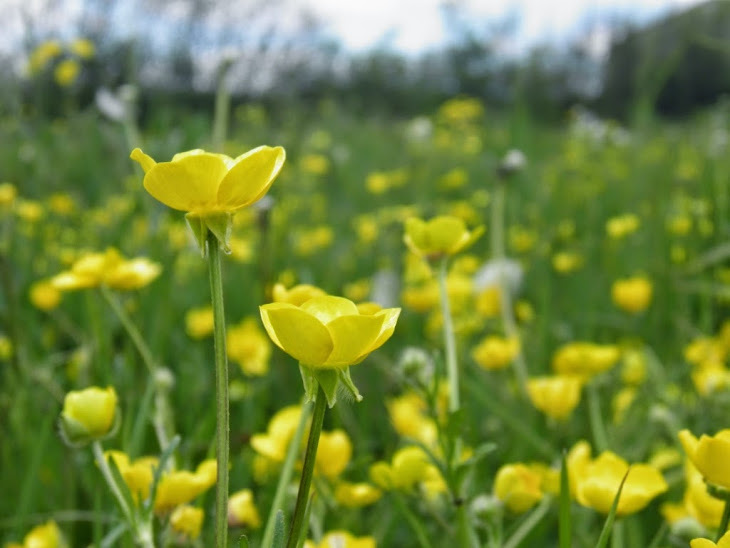 Its innocuous greenish-white flowers do little to make it stand out in the spring. It does however have an interesting and chequered history – Due to it being the winter host for two important crop pests, particularly the black bean aphid (Aphis fabae) which feeds on field beans and sugar beet, it led in the past to widespread removal from hedgerows and woodlands (Thomas. et al., 2011). I guess this explains some of its fragmented occurrence in Britain depending on how zealous and relevant this pest hosting was to local farmers. It did have some historic economic importance due to the wood being very hard, enabling it to be cut to a very sharp point and used in the making of spindles for spinning wool - Any guesses as to how it got its name! Roll forward to Devon, our new home, and lazy summer strolling along local lanes. 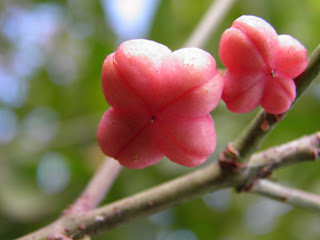 There in the hedge appeared many four lobed coral-pink fruits, sculptured almost unnaturally like trendy buttons or sweets (see image above). 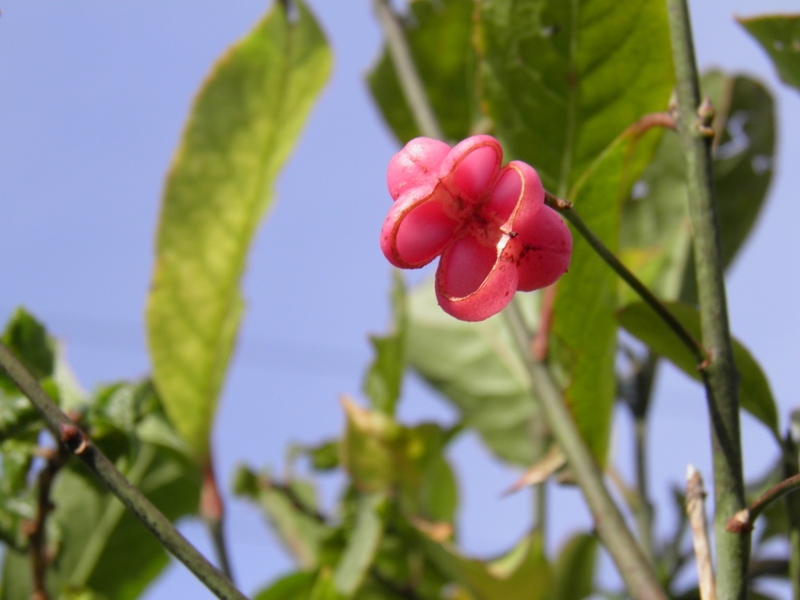 These are the charmingly characteristic products of the Spindle, no longer blending into the background but colourfully and querkily brought forward. As summer has merged into autumn, and flowers and leaves have eventually withdrawn from hedgerows, these spectacular fruits have come further into prominence, advertising a more abundant presence than I had realised. They are now fading as we approach winter, but not without a final flourish of secondary colour and confectionary mimicry, as they expose bright orange sheathed seeds (see image below). In the next week or so the Spindles will have retreated back to being that highly anonymous shrub.